Where should one start with the Supremes in 2019? Some of the prices for the old Hip-O-Select reissues are not the tea but I feel like it would be tough for a compilation to do them justice considering the wealth of material they put out. Tagging @torontodj because I think you'll have an informed answer here. You're right - compilations don't do them enough justice although their run of singles is pretty much flawless for me. To be honest, hunting down all the expanded editions is something I would recommend, even with the ridiculous prices for the earlier albums. Only a few months ago, I found the 40th Anniversary edition of Where Did Our Love Go in a used record shop in Toronto for $20 (!) and it was in good condition. A few knicks on the cover but the CDs looked fine. So, it may be rare, but with some patience, you never know - it might turn up somewhere. Even if you can't find the expanded edition, the original album (CD or vinyl) is really worthwhile. To me, it's like Results or Another Place and Time where every song could have been a single. I think it's a great starting point for The Supremes. 1964 was the year they broke out so it's a fitting place to start. When I couldn't find the expanded edition a few years ago, I bought a Japanese remaster. It sounds fantastic. All of the Hip-O-Select expanded editions are worthwhile. They are a dream for Supremes fans although I listen to More Hits by the Supremes and I Hear A Symphony more than I listen to Meet the Supremes or at the Copa. Thankfully the post-Hip-O-Select editions are all still in print (Supremes Sing Holland-Dozier-Holland, The Supremes A' Go-Go) although it looks like Merry Christmas is going to go out of print soon so good idea to pick it up soon. And of course, the '70s Surpemes. The This is the Story box set is extremely rare nowadays. I bought it just before it went out of print. It's really one of my favourite box sets ever. There's a reason both Where Did Our Love Go 40th and This is the Story are so rare. Because they're so good. Jeffo, djessie and Eric Generic like this. Just with regards the now compilations - the art company - Suzanna , big sound authority - This house etc - would be great. Do ye think further releases of past ablums is likely? Did you manage to get "Get Closer" on CD? That's quite hard to find cheaply. Her iTunes page however seems quite well curated and thought-out, with the releases grouped together by period or genre. Surprisingly, I found a mint copy of Get Closer on CD today. Which means, it will probably be reissued and remastered soon! 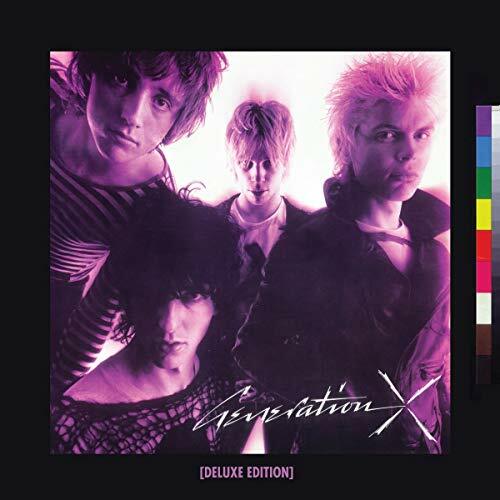 Generation X's debut album is getting a 2-CD deluxe reissue. Never heard of her but I am intrigued by that Fiona artwork - please tell me she is a late 80s Mandy Smith-style pop tart? I'm guessing this will be in one of those slim card cases, with the albums in card wallets (like the Kim Wilde one on Warners. I got all Fiona's CDs when Rock Candy reissued them a few years back. I wonder what the mastering will be like. Oh! The front sleeve design fooled me. Hmm, I get that they're using the full space on the discs, but combining albums like that can be a bit ugly, especially if it's not a neat split between albums (like, say, the Linda Ronstadt "Capitol Years" 2CD which splits the 4 albums equally). Speaking of Kim Wilde: wasn't there supposed to be a box set coming out this year with her early albums? Any further news on that? biffy77, hownee and Eric Generic like this. Wounded Bird have never been known for lavish packaging or stellar sequencing. Their releases tend to be bare bones, but I still like their reissues. The Jocelyn Brown and Apollonia reissues were fine. The Rock Candy reissues of the Fiona CDs have the bonus tracks, so I will definitely not need this latest set. But glad her music's still getting attention. The tracks from Hearts Of Fire are still only on that album, and it's as rare as hen's teeth. Who is the enigmatic Fiona? I have also never heard of her. This is the only song I recall from her. Anjoel40, idratherjack and Eric Generic like this. Fiona Flanagan.....Atlantic Records had high hopes for her in the mid-80s...I think her debut was released in 1985, the follow-up in 1986 and then the third was 1989. She appeared in the flop 1987 film Hearts on Fire with Bob Dylan, and performed several songs on the soundtrack. Then she moved to Geffen for a 1992 album. I'd never heard of her until someone entered a track from her 1989 album in a PJOPS contest. Disco Blister and idratherjack like this. Disco Blister, Anjoel40 and Eric Generic like this. Yes, Stevie Nicks, Pat Benatar, Laura Branigan....a mix of all those. Really good 80s female AOR. biffy77, Disco Blister and idratherjack like this. I thought Pat Benatar too, a combination of those three is quite a potent mix! Sold! I had never heard of her too, but I like US female rock and have checked her out on youtube. I will be buying this. idratherjack, biffy77 and Eric Generic like this.